This two volume history of the Falklands War makes for fascinating and in-depth reading. It goes into the ins and outs of all the diplomatic shenanigans, political impulses and military actions that made up the 10 week confrontation in 1982. It is hard to imagine a more thorough investigation into the causes, course and consequences of the conflict than this one. Having said that, there are a surprising number of errors in the text. They are concentrated in the first chapter of the first book detailing the long term history. 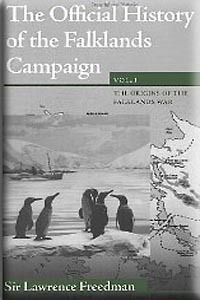 Naturally, any discrepency or deviation from other sanctioned histories is seized upon by proponents and opponents of the British position regarding the sovereignty of the Falkland Islands. The author has actually made an official errata available, but given that this is an 'official' history it does seem as if the checking and editing process was not thorough enough. I also came across other factual errors on names of people involved and in the bibliographies cited. Despite all these faults, you should still persevere with this impressive book. The text can be dry at times and the author does write like a lawyer in places, but the sheer depth and breadth of the background information is illuminating and fascinating. I would say that he does a much better job with the political and diplomatic battlefield where he had access to extensive government papers. The military side is not skimped over but the style of writing does leave it feeling a little dry in places. The first volume is much slimmer than the second one but in many ways is the more interesting as he trawls through the tortuous relations between Britain, the Falkland Islands and Argentina in the run up to the 1982 invasion. 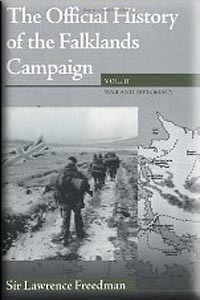 The second volume starts with the overrunning of Stanley but runs through the entire campaign and even into the legacy issues and garrisoning of the Falklands in the years since.